Co-Chair Malcolm Hoenlein said, "I am pleased to co-chair Governor Cuomo's New York-Israel Commission. This trip is an important step in exploring new ways we can continue to grow and expand the strong ties that exist between New York and Israel. Under Governor Cuomo, New York has shown its unwavering commitment to the Jewish community and this initiative will continue to strengthen both our cultural and economic ties and ensure both partners will grow together well into the future." "New York's principles were built on a rock. They will not change and the political winds will not change them." 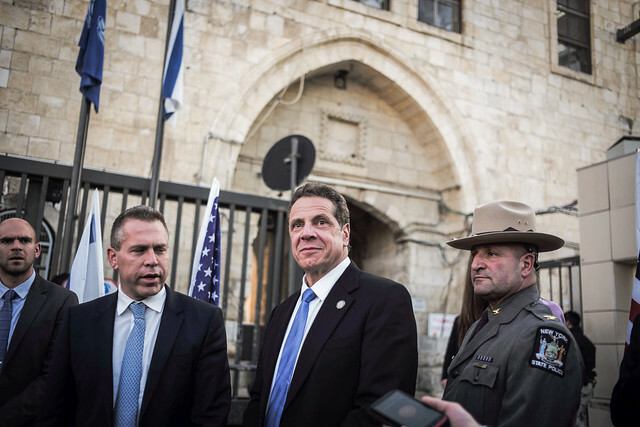 New York and Israel face similar security challenges, including the threat of terrorism. The Commission will support opportunities for both governments to share best practices and benefit from each other’s experience. By connecting New York law enforcement with their Israeli counterparts, the Commission will help New York learn from one of the world’s leaders in counter-terrorism operations. Additionally, the Commission can support a conversation on division and anti-Semitism to ensure that both governments are doing everything they can to fight intolerance and crack down on hate crimes. New York and Israel are home to some of the best research institutions in the world that have untapped opportunities to share ideas and advance cutting-edge research. The Commission will support academic exchanges and catalyze research collaboration between professors and students at SUNY and CUNY colleges and Israeli universities. The Commission will work with partners to support educational exchanges for high school and college students to expose them to new ideas and expand their horizons. To create opportunities for recent graduates, the Commission will connect New York and Israeli students to internship opportunities overseas. New York and Israel share deep cultural bonds that transcend borders. Working with partners already engaged in exchanges between both countries, the Commission will spearhead cultural exchanges for Israeli and New York students to learn about each other’s rich cultural heritages. The Commission will also support a fellowship program for Israeli students and future leaders to visit New York and meet with prominent New Yorkers across industries and sectors. To celebrate New York’s rapidly growing Israeli food scene, the Commission will host an Israeli food festival and partner with the Taste NY initiative to bring local and international chefs around Israeli cuisine. In 2014, Governor Cuomo launched the Global NY initiative to offer one-stop shopping to both foreign businesses looking to invest in New York and to local businesses that want to export their products globally. Global NY currently has a trade office in Israel. Empire State Development maintains close ties with its Israeli counterparts, working cooperatively with the Israel Economic Mission in New York City, and with the America-Israel Chamber of Commerce. Such interactions promote the interest of New York-based companies in the Israeli marketplace, foster cooperation between New York and Israeli companies and institutions and help promote initiatives in specific areas of mutual interest such as, nanotechnology, alternative energy, biotechnology. In 2015, Empire State Development supported 15 New York diamond and jewelry companies during International Diamond Week at the Israel Diamond Center. The participants reported increased export sales of $3.2 million as a result of their participation at the show, with an additional $2.4 million sales anticipated over the following two years. In February 2016 and February 2017, Empire State Development supported 10 companies each time on a trade mission to Israel through the Brooklyn Chamber of Commerce. Individual meetings for the participants resulted in export sales of $1.8 million. The Governor’s New York-Israel commission will build on these and other economic and educational partnerships that exist between businesses in New York and Israel and expand the reach of the Global NY initiative. The Governor launched the creation of the commission while on his economic development and unity trip to Israel. The trip's goal is to strengthen economic ties with Israel and support the Governor's efforts to create new jobs and attract additional international business investment in New York through the Global NY initiative. The trip reinforces the historic relationship between New York and Israel and is part of the state’s ongoing efforts to combat anti-Semitism. The Governor departed for Israel on Saturday, March 4 and will return Monday, March 6. More information on the Governor’s itinerary is available here.